The latter stages of apoptosis involve nuclear changes such as DNA fragmentation, chromatin condensation, inhibition of DNA repair enzymes and the breakdown of structural nuclear proteins. Activated caspases are involved upstream in many of these processes often acting on substrates that ultimately lead to DNA damage and fragmentation. 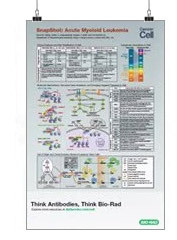 Our range of apoptosis antibodies are available in different formats, suitable for many applications. 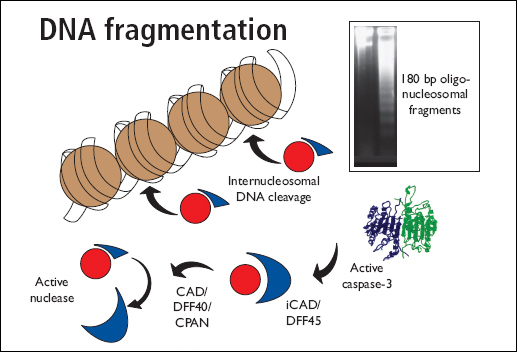 Caspases are indirectly involed in DNA fragmentation by activating cellular nucleases: CAD (caspase activated DNase) also called DFF40 (DNA fragmentation factor) exists in an inactive form by complexing with ICAD (inhibitor of CAD). During apoptosis caspase 3 cleaves ICAD, releasing and activating CAD which causes DNA degradation and chromatin condensation. Chromosomal DNA is first broken into large fragments (50 - 300 kilobases) before they are cleaved into smaller nucleosomal fragments (approximately 200 base pairs). Extraction of the DNA fragments from apoptosis cells followed by agarose gel electrophoresis results in a distinctive DNA ladder appearance. Bromodeoxyuridine (5-bromo-2-deoxyuridine, BrdU) is an analog of the DNA base thymidine. During DNA synthesis, BrdU can replace thymidine and be incorporated into the newly synthesized DNA of dividing cells. Our BrdU antibodies provide a powerful tool to detect the cell cycle position of apoptotic cells. Mouse Anti-BrdU Antibody, clone Bu20a (MCA2483), has been referenced in 12 scientific publications and is supported by flow cytometry and immunocytochemistry protocols and images. Inhibition of DNA repair enzymes by caspases leads to DNA fragmentation. One important DNA repair enzyme is Poly (ADP-ribose) polymerase (PARP) which binds to DNA strand breaks. PARP is involved in the base excision repair pathway by catalysing the synthesis of poly (ADP-ribose) and modifying nuclear proteins. Caspase 3 cleavage of PARP inhibits its ability to repair DNA damage. Our PARP antibodies are suitable for many applications including immunofluorescence microscopy, immunohistochemistry of both frozen and paraffin embedded tissue sections and western blotting. These products are from our selection of performance guaranteed DNA damage and repair antibodies. DAPI is a dye that can be used as a tool to visualise nuclear changes and assess apoptosis. DAPI binds strongly and selectively to the minor groove of adenine-thymine regions of DNA. When bound to double-stranded DNA, DAPI absorbs light at 340nm (ultraviolet light) and emits at 488nm (fluoresces blue). Bound DAPI has a fluorescence intensity approximately 20 fold higher than that of unbound DAPI. The fluorescence is also directly proportional to the amount of DNA present. As the apoptotic cell membrane is compromised, more DAPI enters the cell and stains a stronger blue colour. The differing nuclear morphology of apoptotic cells such as chromosome condensation and fragmentation also helps with visual identification of apoptotic cells stained with DAPI. DAPI is cell-permeable and is commonly used to detect DNA in immunofluorescence, histochemical and in situ hybridisation procedures. Freire, R. et al. (2001) Cleavage of the Bloom’s syndrome gene product during apoptosis by caspase-3 results in an impaired interaction with topoisomerase III alpha. Krohn, A. et al. (1998) Staurosporine-induced apoptosis of cultured rat hippocampal neurons involves caspase-1-like proteases as upstream initiators and increased production of superoxide as a main downstream effector. Enari, M. et al. (1998) A caspase-activated DNase that degrades DNA during apoptosis, and its inhibitor ICAD. Inohara, N. et al. (1999) Identification of regulatory and catalytic domains in the apoptosis nuclease DFF40/CAD. Sakahira, H. et al. (1998) Cleavage of CAD inhibitor in CAD activation and DNA degradation during apoptosis. Wyllie, A. (1998) Apoptosis: An endonuclease at last.